Casa Indigo is a three-bedroom, three-and-a-half-bathroom house featuring a rooftop terrace designed to host sophisticated cocktail parties or to calmly admire sunrises and sunsets. The covered sitting and dining areas allow for diverse homey experiences. The flawlessly equipped kitchen will be the meeting point for memorable gastronomic adventures. A fresh décor combining smart features and tropical art pieces will glamourize your stay. 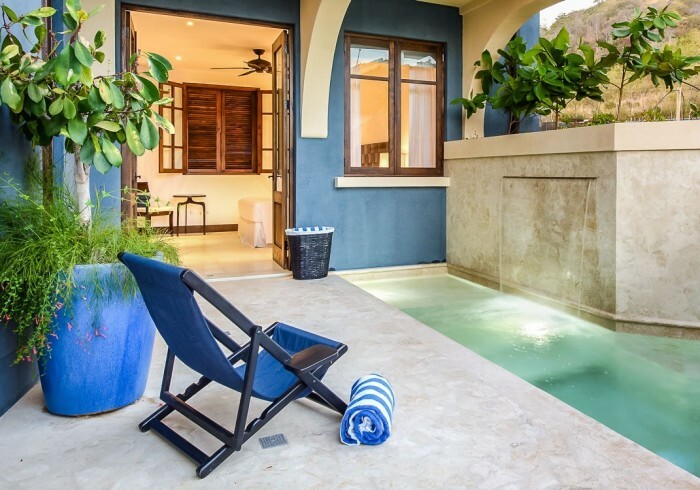 Each of the three bedrooms at Casa Indigo has its own private bathroom, air conditioning system, and ceiling fans. The spacious master bedroom offers a king size bed, walk-in closet, and its own private terrace elegantly overlooking the ocean. The guest bedroom on the same level offers two single beds that we are able to arrange as a king bed if needed and a private terrace with a swing where you can rock your cares away. The guest bedroom on the main level features a queen bed and direct access to the direct access to the swimming pool.